Matt Whipkey is a critically acclaimed, award winning singer songwriter and instructor, independently releasing nine albums since 2002. Matt is a firm believer that music exists in everyone. Through instruction he assists people of all ages in finding their own unique and inherent voice. Whether through the guitar, songwriting, or lyric composition, Matt has learned and earned the skills necessary in helping the student believe not only in music but themselves. 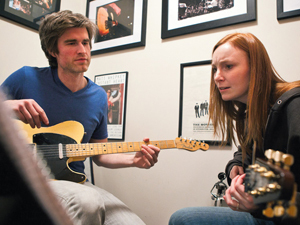 Matt offers group instruction in the areas of basic and advanced guitar performance, songwriting and lyric composition. Instruction will be split between a large group format, smaller group formation and even individual instruction.